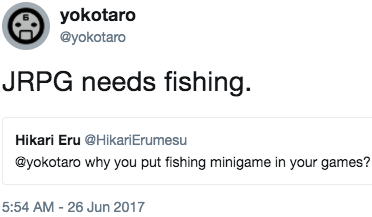 There’s no way to actually prove this, but I’m pretty sure more people have played fishing mini-games than have actually gone fishing. You can fish in Zelda, in Nier, in Red Dead Redemption 2, in Pokemon, in Deadly Premonition, in Torchlight, in Yakuza. You can hardly walk into a Gamestop without tripping over a pile of rods and tackle boxes. And of course fishing is especially prominent in life sim games like Animal Crossing, Harvest Moon, and Stardew Valley. 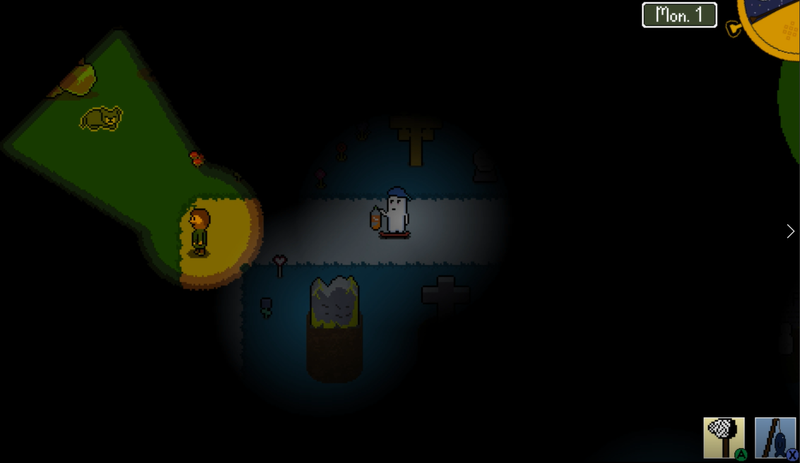 Village Monsters is no different – fishing was one of the first hobbies I added to the game. There’s a lot to draw inspiration from, and if it seems the tone of this post is overly negative it isn’t because I don’t like fishing mini-games… it’s because of how intimidating they are! With so many different standards and expectations there are almost too many options, and this left me feeling paralyzed when designing the system for my game. The good news is I’ve finally settled on a system, and I’m super excited to talk about it. But first let’s talk about how bad of a designer I am. I prototype every feature – often before I even analyze or document it – and fishing was no different. In a lot of ways prototypes are ‘meant’ to fail (seeing what doesn’t work is more valuable sometimes than seeing what does), but my fishing prototypes took the word ‘failure’ to a whole new level. My very first prototype was similar to what you find in Breath of Fire. You’d be presented with a side view of the body of water you’re fishing in and your goal was to guide your hook to a fish and reel it back to shore. 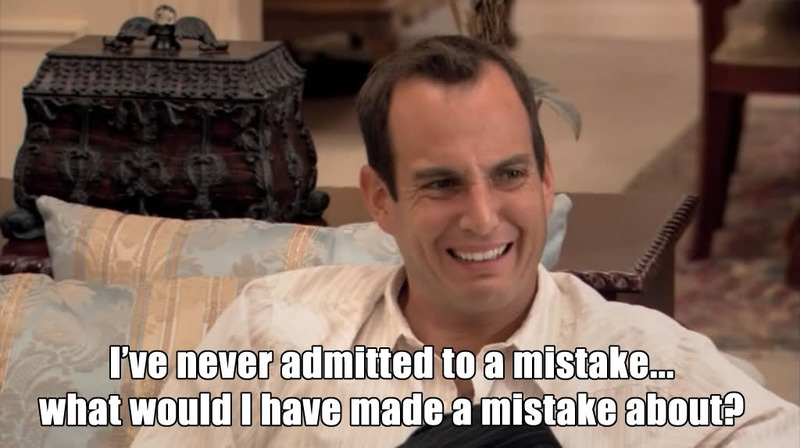 It was… fine. It was certainly unique compared to my contemporaries, but the more I played with it the more I realized this wasn’t necessarily a good thing. It was equal parts clunky and boring, and I scrapped it shortly before the Kickstarter. The prototypes that followed were all over the place. I experimented with “fish HP” and “rod HP”, I put in timed button challenges, I tried out things like line strength and fish stamina and generated all sorts of random numbers. I wanted to capture the full cycle of fishing – the relaxation of waiting, the excitement of hooking, the struggle of reeling in a big one – but nothing I tried was working. You might even say I was floundering… heh… heh… ugh. Fishing in Village Monsters can be broken up into three distinct phases which I lovingly call Dash, Mash, and Clash. After casting your line in a body of water the music dims and you can let your mind wander as the outside world fades into the periphery – that is, until a fish bites. That’s the Dash, referring to how you must quickly hook the fish before it gets away. After hooking the fish it’s time to Mash, which is exactly what it sounds like. Your job is to reel in the fish as fast as possible. There’s no subtlety required, so mash that reel button as hard as you can. A little fishing meter tracks your progress. Of course, most fish won’t be too pleased about the hook in their mouth and they’ll often try to fight back. This leads to our next stage, Clash, which finds you being challenged with a series of button prompts as the fish attempts to get away. If you miss a prompt then you’ll start losing the progress you made reeling the fish in. Miss too many and the slippery fish will make their escape.. However! If you manage to get a “Perfect” during this stage then the fish’s defenses are shattered which makes it much easier to reel in. This gives the clash stage a high risk / high reward component and acts as a test of skill compared to the previous test of stamina. These two stages cycle back and forth until the fish is caught or gets away. How often they cycle and for how long depends on the fish. Easier or smaller fish need less reeling in while legendary fish require several clashes before they submit. And there you have it! Fishing is finalized in forthcoming folly, Fillage Fonsters. Finalizing any gameplay mechanic is sorta like writing the 1st draft of a story – it’s a great feeling of accomplishment, but there’s lot of editing and polish to do. Now that I have all these levers and nobs to play with it’s time to give each fish a “personality” – heavy fish that are hard to reel in, fish with extremely quick ‘hook windows’, and so on. There’s also an entire range of possibilities for upgrades: lures that attract fish faster or rods that make reeling in easier. Then I can start looping back into other parts of the game, like a potion that slows down the clash stage, or a mushroom that attracts rare fish when used as bait. You’ll be able to play with the new fishing system yourself once the latest Village Monsters demo hits later this month. About a year ago I revealed what was then a new in-game hobby – Gardening. As I worked on the design I realized that while I knew what I didn’t want – I didn’t want it to be like Harvest Moon, and I didn’t want it to be just a mini-game – I couldn’t nail down what I did want. With no clear vision the work on Gardening unsurprisingly stalled. Later this year it fizzled out completely and I considered just cutting it altogether. Then one day I happened to be working on the village currency. I figured that monsters would be unlikely to use gold – that has way too much human baggage, right? – so I went with silver. Seems appropriately monster-y. It was then that it hit me. Monsters wouldn’t grow turnips or flowers as hobby. Ridiculous! They’d grow mushrooms! Secret of Mana even contains a whole village of ’em! In this week’s dev diary I’m going to talk about this newly overhauled hobby. So you want to a Mushroom Gardener, huh? Well first you’re going to need some spores. You could buy them, sure, but you can also forage mushrooms out in the wild and use them in your garden. Spores must be planted in a designated mushroom plot, but apart from picking a soil type it’s pretty low maintenance. You won’t need to water them or pick any weeds. Instead of focusing on the more mundane aspects of growing I wanted to free up your time to instead work on the fun stuff – things like cultivating hybrids, discovering bizarre mutations, and cooking up all sorts of interesting effects. You’ve already seen many examples of effects in the form of potions, but I’ve since overhauled the system so that any item has the ability to create some kind of effect. Mushrooms are now the primary way to access these effects. Having trouble catching a fast critter? 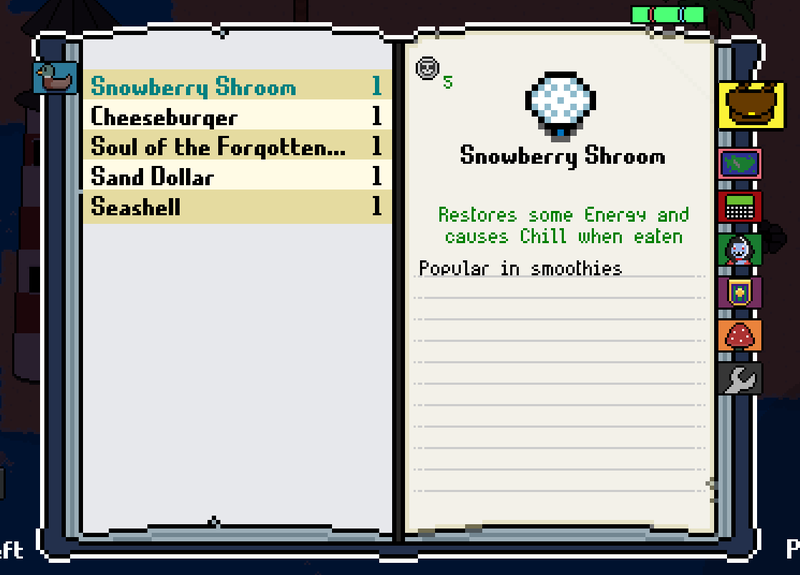 Bait your traps with a Snowberry Shroom and you’ll chill (and slow) the critter that eats it. Use your mushrooms in Cooking to make a meal that restores energy, makes you move faster, and slows down time. There’s a huge amount of effects to discover. Some are practical, others are just weird. Some break the game. They’ve been fun to program and test, so I really hope you can enjoy them! I love the idea of making plant hybrids. It’s like playing mad scientist, only instead of frankenstein you can make a seedless watermelon that resists the cold. In the world of Village Monsters mushrooms as highly malleable. This means that a talented mushroom gardener can create brand new species with just a bit of effort. All you need are two fully grown mushrooms in the same plot as an empty tile. Then you just let nature take it’s course…………. if you know what I mean. The most practical benefit of growing hybrids is that the resulting new offspring can contain the attributes and effects of its parents. For example, a Spicy Shroom is a fast grower and it can pass down this benefit to its offspring. There’s also breeding for aesthetics, like rare colors or glows effects. You can grow some pretty funky mushrooms, but some will require generations of hybrids to unlock. Best of all you can usually process hybrids for their spores allowing you to plant your new strain indefinitely. There’s one other thing that can happen to your growing gardening – mutations. Mutations are similar to hybrids in that they create unique mushrooms, but mutations are more unique, more bizarre, and certainly more unpredictable. Mutations also don’t require a ‘parent’ mushroom and can occur to any mushroom that’s still growing. You can influence mutations by the type of soil you use and some unique upgrades. Like hybrids you can usually grab the spores from your newly birthed creation to permanently add it to your garden journal. 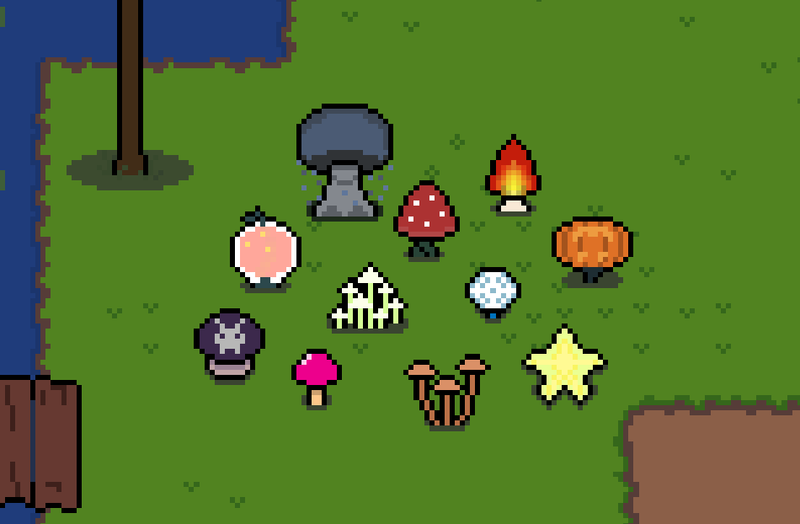 I’m considering adding a touch of procedural generation to get some truly weird mushrooms that even I can’t predict, but that might have to wait for a future free update. That’s enough mushrooms for now. You’ll be able to play with them yourself when the next demo releases later this month. What goes bump in the afternoon? The next public demo for Village Monsters – which you might know as Candy Corn – needs to be bumped to November. The exact release date and eye-roll-worthy nickname will be announced a little later. Last time I delayed a demo it was because I still had work to do. This time it’s sorta the opposite – I actually want to make the demo contain even more stuff. I was reviewing my roadmap (and you can too!) and realized that this is the second-to-last demo. Demo feedback has always been immensely valuable to me, so I want to squeeze as much as I can into the release so you have more to play with so you can in turn give me more feedback. Another (and less flattering) way to look at it is that I didn’t get nearly as much done as I hoped back when I scheduled this release in August. We won’t talk about that, though. You could simply ask “why don’t you just release what you have now and make an extra demo later?”, and it’s a fair question, but the answer is that releasing a demo is a lot of work. Time is at a premium these days, so creating fewer (but bigger) demos just fits my schedule a lot better. All this can only mean one thing: it’s the officially month of monsters. One of my favorite trends in video game development is how increasingly open its become. It used to be that game creation was (to players, at least) an unknowable and arcane process that you could only catch glimpses of in magazines or websites. These days you can find all sorts of examples of refreshingly open development – there’s Dwarf Fortress’ extensive roadmap and dev logs, Subnautica went and made their whole Trello board public, and even big companies like Fortnite are letting everyone see progress on feedback and suggestions. I’ve been creating developer diaries and public demos since I started Village Monsters, but I wanted to do even more – I wanted to be as transparent and candid and naked as possible. So I decided to do just that. Not the naked part, I’m still mostly clothed. Release: Summer Sherbert Demo is now available for Mac! 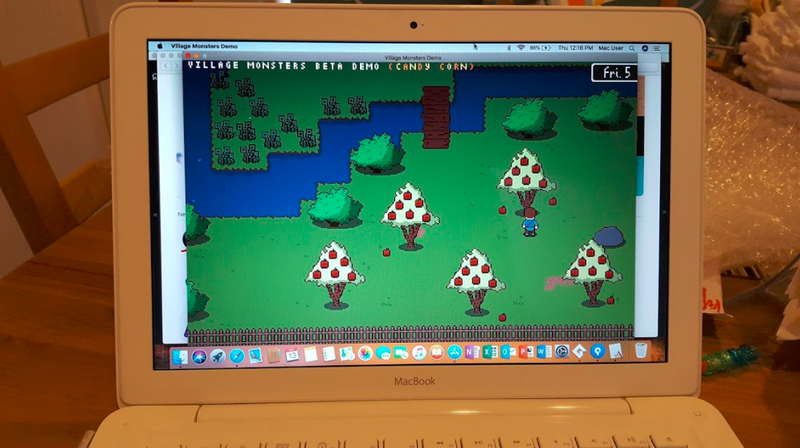 Good news, Appleheads: Village Monsters is now available on Mac! As with the Linux releases, the Mac versions will be labeled as “Lightly Tested” until I’m more comfortable with the process. On my old (~2009) MacBook it runs but at a low performance – which I suppose is to be expected from a 9 year old laptop. Going forward all three platforms should release at the same time, which is a very big step for our little monster game.